Book with Falcon Charter Bus for easy bus transportation during your next Nashville trip. No matter what brings you into the city, we’ll make sure you travel in complete comfort with a modern coach rental. Call us today at 615-206-7958 to get started! Falcon Charter Bus is dedicated to giving you the best Nashville travel experience. From the Grand Ole Opry to the Parthenon replica, we’ll make sure your group travels in absolute comfort from one stop to the next. Send us your itinerary and we’ll take it from there, finding you the perfect bus with a professional driver to make your trip simple. Choose from minibuses, charter buses, and everything in between to perfectly suit your group’s needs. All passengers will stay organized throughout your trip, so you’ll be able to relax knowing that everyone will arrive to each stop on time. Amenities include reclining seats, air conditioning, WiFi, power outlets, extra storage and legroom, and on-board restrooms. You can enjoy every moment of your trip on your comfortable bus while your driver handles all navigation and parking worries. Book a personal charter bus for your next large group event in Nashville! Whether it’s for a wedding, business event, or family reunion, everyone will stay organized amongst the chaos with a bus as your personal transportation service. If your event takes place across multiple venues, we’ll find a minibus to act as your personal shuttle service that will run on your exact predetermined schedule. Need to bring in your group from out of town? Book your own bus for private, comfortable accommodations throughout your trip. Make your upcoming field trip unforgettable with a modern, air-conditioned bus for all of your students and chaperones to enjoy. Students will remain comfortable and entertained on the way to destinations such as the Adventure Science Center with WiFi, power outlets, and televisions available at your request. Chaperones can relax and enjoy reclining seats during the trip, ensuring that everyone will arrive rested and ready to learn at your destination. With a private coach from Falcon Charter Bus, your trip is in your hands. Plan your own itinerary, travel on your time, and enjoy private and personalized accommodations throughout your trip. One of our experienced reservation specialists will work with you to ensure that you’re receiving the best possible bus at the best rate, making the reservation process easy and enjoyable from beginning to end. No matter what brings you to Nashville, we’ll guarantee the perfect trip for you and your group. Need a ride to other southern destinations in Atlanta, Columbia, Charlotte, Tallahassee, Orlando, or Miami? 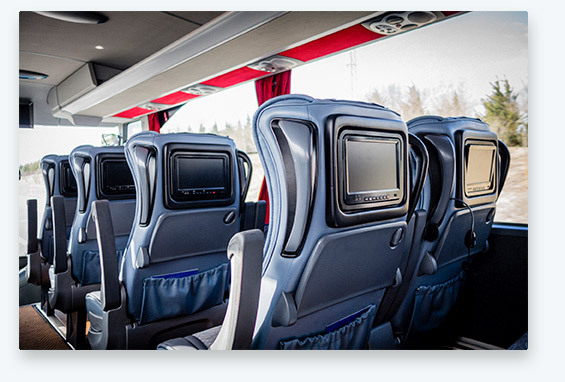 Rely on Falcon Charter Bus to get you there in comfort and style. With service across the Southeast, we’re your #1 choice for charter bus rentals all over the region. Call our reservation specialists today at 615-206-7958 to secure your own Nashville charter bus! We’re available 24 hours a day to find the best bus for you and guarantee an unforgettable trip. We are proud to be included on several reputable websites including Merchant Circle, Chamber of Commerce, Hotfrog, eLocal, EZ Local, City Squares, Get Fave, SaleSpider and Cylex.